Getting annuals, perennials, vegetable gardens, shrubs, trees and the lawn through periods of extreme heat is a challenge throughout the Midwest and North. Southern regions typically grow different plants that are much more heat tolerant. Cool region plants are typically not so tolerant of heat extremes, especially if the conditions persist for several days or more. But there are several things midwest gardeners can do to help plants get through extended periods of heat and drought. Put containers and hanging baskets in the shade when extreme heat hits. Even sun loving annuals will benefit from shade in hot periods. Most containers are not large enough to retain moisture very long, so they will likely need water every day and probably twice a day if temperatures are near or over 100 degrees. 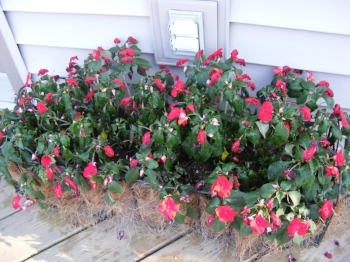 Shade loving plants, such as impatiens and begonia will need water twice a day. After the heat of the day the plants may be wilting even if the soil is moist. A light sprinkling after they are out of the sun will cool down and refresh the plants. Mulch containers to help keep the soil moist and cool, hot soil is not good for the plants. Since you cannot provide extra shade for your garden beds, at least make sure the soil stays moist. The surface will dry out quickly in extreme heat but if the soil is moist at the root level your plants can survive. If you have not mulched garden beds or if the mulch is thin, apply up to 3 inches of mulch at the first sign of prolonged heat. You can use wood bark or chips, compost, leaves or lawn clippings. The mulch will help the soil remain moist and cool. Slopes and raised beds will dry out more quickly than level ground, so keep an eye on those areas, they may need water every day to keep your plants alive. Shade plants also will likely need water every day, the most delicate of them twice a day. Annuals, perennials and vegetable gardens that are sun loving may only need water every other day but that depends on just how hot it is and how long the heat has persisted. Your plants will likely let you know if the soil has dried too much, watch closely for even the slightest wilting. By the time there is even a slight wilt, the plant has become very stressed. Water only in the morning or evening. Evaporation will quickly remove the water we are trying to provide to the plant, and sun is intensified through water droplets on the leaves, causing the leaves to burn. A big mistake we probably have all made, I’ve said it myself: “but the tomatoes and geraniums are loving the heat!” Plants grow extremely fast in extreme heat, tomatoes are a good example. But this is not good for the plant. Speeding up the growth process deteriorates the plant, and this will happen if temperatures persist over 90 degrees. So don’t let rapid growth fool you, the plants are being stressed and you need to do whatever you can to keep the soil moist and cool even if you can’t provide shade. Another big mistake is fertilizing plants that have begun to yellow or deteriorate in the heat. Plants take up water very rapidly in extreme heat. If you fertilize in the heat, the fertilizer is also taken up rapidly, resulting in burned plants. The plants do need more fertilizer in the heat since rapid growth depletes their nutrients. But fertilizing should be done by applying a layer of compost around the plants before the summer heats up, allowing the slow and regular intake of nutrients through the soil. If you feel you must fertilize in summer heat, use a fish emulsion applied when watering. Many homeowners allow their lawns to simply go dormant during extreme heat and drought, and I have even heard so called experts recommend doing just that. The grass itself may revive under better conditions. However, in the meantime heat and drought tolerant weeds will grow like crazy and spread. And the grass has become very weak, stressed, and nutrient starved if it goes dormant. By the time the grass revives and gets healthy again you have a very weedy lawn. You may prefer instead to preserve a healthy lawn through the drought. And with a few simple steps you can do that. Keep your lawn strong and healthy by fertilizing it. Even as summer begins to heat up you can apply a light dose of lower nitrogen fertilizer just before rain is expected or before watering your lawn. Your grass will be much better prepared for heat and drought because it is strong and healthy. Also start raising your lawn mower blade as the summer heats up. Even without extreme conditions you should be raising the blade 2 or 3 times in stages through the summer. The longer grass (you should be mowing it to 3” long in the heat of summer) accomplishes several things. It shades the soil, keeping it moist and cool longer. Longer grass blades are also holding more water that can be used to survive until the next rain (much like a young plant or seedling can’t survive in heat, as the plant gets larger it is stronger and has more water available). And it allows you to continue a more regular mowing schedule without having to whack down a big chunk of the grass blades after the heat passes, which really stresses the lawn. During extreme heat and drought the lawn will be stressed and will not be growing as quickly so you will be able to longer between mowings. But if you let it get long just for a dry period and then mow off more than half the grass blades, you will wind up with a stressed lawn anyway and gain little. Last but certainly not least, water your lawn. But do it smart so you are not wasting water and money. Start by giving “hot spots” a good soak. These are the areas that get sun all day, along hot blacktop, slopes, and western and southern exposures. A light sprinkling will not help and may hurt. Get the water deep enough for the roots to use, they are much more efficient at taking up the water than the top growth is. An hour of steady sprinkling should penetrate the soil as much as 3-6”. Water early in the day so the sun and heat don’t evaporate the water before it even soaks in, and water evaporation from the plants in extreme heat will cause wilt or burn. Night watering is not normally advised because your plants stay wet until the sun comes out, inviting mildew, disease, and pests. But, well, most of us have to go to work in the morning! We don’t have much choice but to water in the evening, and that is still better than watering in the heat of the day. During a drought and extreme heat the plants will usually dry out quickly unless humidity is also very high. Try to water shaded areas right after work and move to sun exposed areas as sundown approaches since they will be hot and the grass will dry more quickly. Due to watering restrictions, you may have no choice but to let your lawn go dormant. Once there is relief with rain or lifting of watering restrictions, you may be anxious to perform all the late summer and fall chores that normally refresh your lawn. But the grass is extremely stressed, and spraying for weeds, aerating, power raking and even fertilizing will damage a severely stressed lawn. First, water at least an inch per week until the grass is refreshed, green and growing. Second, fertilize with a low dose of nitrogen just before rain is expected or before sprinkling. You can either purchase a low nitrogen fertilizer or apply at half the recommended rate. As soon as your lawn looks green and healthy it is safe to apply weed control, but don’t overdo it! Mixed at high ratios or applied at a heavy rate, weed control chemicals can burn your grass even when it is healthy. Aeration can also be performed once the grass is green, growing and healthy. Power raking (de-thatching) is better left for spring under any conditions, but many people prefer to perform power raking in fall. Done early enough on a healthy lawn, damaged turf crowns will have time to heal before winter. Like everything else, a strong and healthy bush or tree will get through extreme heat and drought best. Make sure they have been regularly watered deeply and fertilized in the spring. Mulch should be applied at least three inches thick and extend at least 3-5” beyond the drip line. The mulch should not come in contact with the trunk. Use a coarse mulch that will allow water to pass through easily but shades the soil. Don’t prune just before summer heat sets in as new growth is most susceptible to the effects of drought and heat. Sun loving shrubs and trees generally establish deep root systems and will get through drought fairly well if they have been receiving enough water. New growth and young leaves will be the first to show signs of stress. Watch for wilting, yellowing, or curling or burning of leaf edges. Evergreen needles may change color or brown at the tips. Young new growth on evergreens may wilt. Unfortunately, by the time symptoms appear on shrubs and trees, the plant is already severely stressed. And sometimes the effect of drought and heat don’t even surface for a year or two. When extreme heat and or drought sets in, make sure your bushes, ornamental trees, shade trees and evergreens get a deep soaking. Through extended periods of drought, they should be soaked weekly. Large shade trees require a tremendous amount of water to keep a large leaf canopy alive, so they will be drawing every bit of water from the soil in a very large surrounding area. This will very quickly deplete the soil of water normally shared by surrounding plants and turf. To deep soak trees and shrubs, place a hose near the base of the trunk and run at a slow trickle for several hours. A gushing hose will put more water in the soil very quickly, but it will usually run off or spread rather than soak deep to reach where the major tree roots are. Large evergreens are very susceptible to stress during drought and extreme heat. Although their needles do not require quite as much water as leafy deciduous canopies, they typically have very shallow roots. Since the top few inches of soil will dry out very quickly, most of their roots have no access to water. The evergreen will eventually start dropping needles to survive. Many evergreens will be unable to regenerate needles even after drought recovery and you will be left with some bare limbs that will need to be removed. If the evergreen is young enough you may be able to allow tip growth to “cover” the bare limbs, but a mature evergreen never seems to generate enough new growth to cover the bare limbs. Evergreens can be soaked in a wide surrounding area with a stationary or fixed sprinkler (not oscillating or pulsating) that sends out a small fan or fountain of water. These will soak a wider area than a trickling hose for the shallower evergreen roots. Move the sprinkler around the evergreen to soak the entire root area, allowing it to run up to an hour in each position. Extended periods of extreme drought may cause trees and shrubs to go dormant during the growing season. Typically the leaves will start to drop, often without even turning yellow or brown. Leaves won’t turn typical fall colors first, that is a result of diminishing sunlight. The plant is protecting itself by eliminating it’s greatest water need, the leaves. Actually there are several stress situations that cause a shrub or tree to drop leaves, including over watering. When caused by extreme heat and drought, saving the plant is still possible. Keep deep soaking the roots. Even if all the leaves have dropped, the roots trunk and limbs are still struggling to survive for next season. They need water to make it. Shrubs and trees that have dropped their leaves and still receive no water have not gone through the normal dormancy process, which requires water, and will likely not survive. Depending on when in the growing season the extreme weather subsides, you could possibly see signs of life late in the season. But don’t despair, it may be fine next spring. Sometimes you may find single branches that seem to be completely dead, with every leaf turned brown. Both extreme heat and drought can put enormous stress on plants that make them susceptible to disease and insects. If whatever the problem is seems confined to individual branches, remove those branches entirely. Even if the cause is simply heat stress, this “thinning” of the crown will reduce the need for water, allow more moisture to penetrate the crown to the roots, and balance the crown to the root structure. Thinning the crown of trees every several years and shrubs every few years is good preventive maintenance in protecting the plants from drought and extreme heat. Keeping everything alive during drought and extreme heat requires time and diligence. But when the weather finally breaks you won’t be replacing dead plants.